We now offer the option to apply custom Attendance reason codes that result in a set minutes that you decide on being deducted from the scheduled hours. An example would be Left Early but you can create any custom Reason code that you prefer. You simply check off the student as present and then click ! to pick from your custom Attendance Penalty list. See more details below! Please Note: An important change was made here for Late default from % to actual minutes. The Late default is now set to 15 minutes for all clients. When you select Late (L) on the attendance list the default late minutes are deducted from the scheduled hours. This can be changed under Username (Top Right) > Institution Confg > Courses > Defaults > Default Late Amount (min) = 15. How do Attendance Penalties work? This function is setup under the Institution Config Menu accessible by any Admin User. If you do not see this menu please contact us via support@ampeducator.com to confirm your Admin User. Any Administrator User under Username (Top Right) > Institution Config->Courses->Penalties you can now define a list of attendance penalty reasons. You need to enter a penalty code, reason and default minutes. There are 2 default penalties - Left Early and Not Participating. We added an extra icon under attendance which looks like an exclamation point by default. 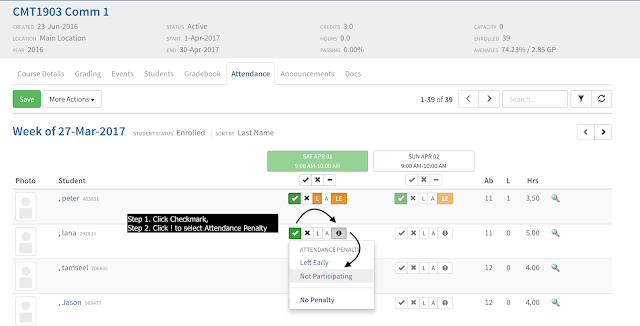 When taking attendance in the list you can click on it and select the attendance penalty. This will deduct the default attendance penalty from the time. You can select 'No Penalty' to remove the penalty. When you select an attendance penalty the icon changes to the attendance penalty code. If you select L on the attendance list it will now deduct the default late amount (15 minutes unless you set it to be something else). If you're doing attendance by hours you can still select a penalty but because you are entering the actual hours it won't deduct anything - just flag the penalty. We added an extra icon for attendance like the list above. The only difference is that when a penalty is selected you can see the actual minutes deducted and adjust it. If you're doing attendance by hours you can still select a penalty but only as a flag. 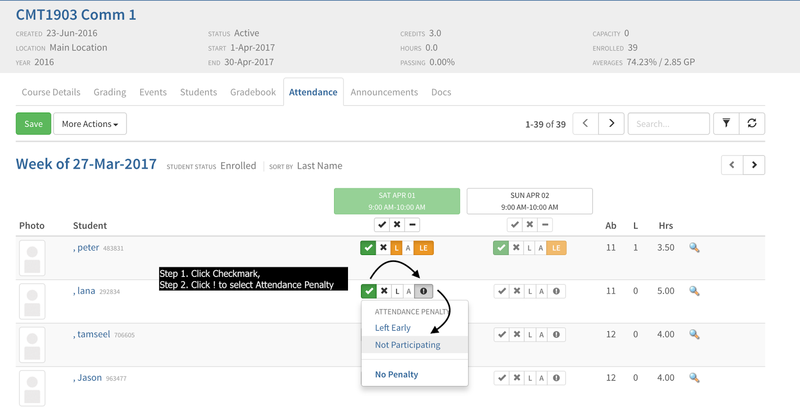 When viewing student attendance under Students or Student Portal the penalty shows up. If there is a penalty the penalty icon changes to the penalty code. The penalty reason and minutes is also listed in the notes. When generating an attendance report it will let you know when a penalty was assigned with '(Penalty)' and list the reason and minutes under notes.